All children seem to be fascinated by sharks. I am not sure why they hold so much attraction, after all there are other animals that are much more fearsome in terms of their deadliness (mosquitoes, jellyfish, snakes etc.) I think it must be their menacing ways and most importantly their Big Pointy Teeth. The Child is very much into sharks and loves watching documentaries about them. He recently watched the Shark Week episodes which included the episode about the Megalodon. The Megalodon seems to be of particular interest to all shark-mad children. This massive shark is 3 times the size of a great white shark and must have been a truly fearsome predator. It is said to be extinct now, so The Child was very excited to watch the Shark Week episode about The Megalodon where they were considering the possibility that this creature might actually still exist. It started off with some video footage from a phone where some people had gone out on a fishing expedition in South Africa. The day started off well, everyone was very excited. It then cuts to footage where it is getting dark and then something crashes into the boat. There is panic as something keeps crashing into the boat and then the phone gets flung to the side and you can’t see any more. You are then informed that that was actual footage and that none of the people on the boat were ever found again. Well, I watched this in absolute horror. The programme went on to explore the fact that Megalodon still exists, complete with interviews and more video footage. The Child was fascinated. I told quite a few people over the coming weeks about this gruesome footage I had seen and how the Megalodon might still exist and how people on a boat had been attacked and eaten adn how traumatised I was. It was only a few weeks later when I googled something about a Megalodon and up pops a link to the Shark Week Mocumentary about the Megalodon. Filmed in the style of a documentary, it was all a spoof. I had been well and truly had! Doh, yes I know, gullible foolish etc. etc...The Child, however was hooked and talked so excitedly about how the Megalodon might still exist...anyway, whether or not it exists now, it definitely did exist once upon a time. We know this because of the fossils that people have found of Megalodon teeth. The Child also watched another documentary about shark attacks. This was very gruesome – I walked in half way through to see a woman (who survived) an attack, but they were showing footage of her injuries. Her arm was so damaged, it looked like a very mangled chicken drumstick complete with muscles, bones etc. all torn to shreds. I sat down to watch a bit more (for I too am fascinated by all shark type things). Anyway, next up on this shark attack documentary was footage of some surfers at Jeffrey’s Bay, in South Africa who were properly attacked by some Great Whites and it went on to talk about how Jeffrey’s Bay was a hot spot for shark attacks. My mouth dropped open at this point. Let me give you some context. Many years ago (pre children) myself and my husband travelled around southern Africa. We saw many wonderful sights and experienced many wonderful things. One of the places we stopped at was Jeffrey’s Bay. We arrived in the evening and checked into the backpackers hostel. They had a bar and there was a great party atmosphere and the beer was flowing. We got very drunk. The bartender by night, was a surf instructor by day. He persuaded us to sign up for a surf lesson in the morning, so at 9am, very hungover we turned up for our first surf lesson. Pulling my very tight wetsuit on, trying not to be sick on myself in my hot, claustrophobic wetsuit, we practised the basics on the sand, then into the sea for the real thing. It is much harder than it looks. I think I managed to stand up once but otherwise I was under the water a lot. I had queried with the surf instructor / bartender whether or not there were many sharks in this area. He told me it was not really an area that sharks seemed to come to. I believed him. I was also pacified by the fact that both myself and The Husband were wearing black wetsuits. I know that surfers sometimes get bitten by mistake as the shark confuses them for a seal. In this instance I was safe in the knowledge that the Husband looked like a much bigger, more meaty seal than me. It was only at the end of the surf lesson when something bumped into the surf instructor’s leg and he totally freaked out, jumping out of the water, that I realised that things might not be as I first thought regarding sharks. (turned out it was a jellyfish). Anyway, surf lesson over, hangover cured and having had fun I thought not much more of it – until I saw this documentary. 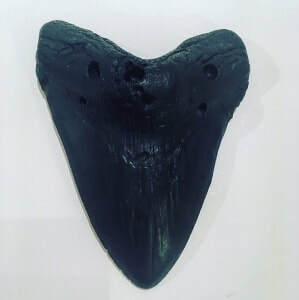 We found a replica version of a Megalodon Tooth on eBay (the actual fossils are quite expensive). This was a cast made from an actual fossil and looks most realistic. It found its way into The Child’s Christmas stocking last year. It has turned out to be one of his most treasured items and a big hit at show and tell. There are also some replica teeth available on Amazon.